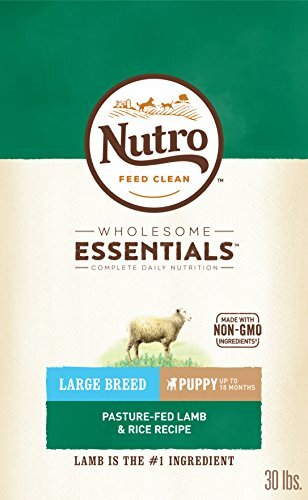 Is Nutro a good choice for my puppy? Good morning, or evening, or afternoon, friends! Wherever you may be right now, we hope you’re excited to find out a little more about Nutro, and how their puppy food and dog food can benefit your little fluffy friend. As always, we’ve brought you the low-down on all the nutrients, ingredients, variety, and flavors so that you don’t have to do it yourself. 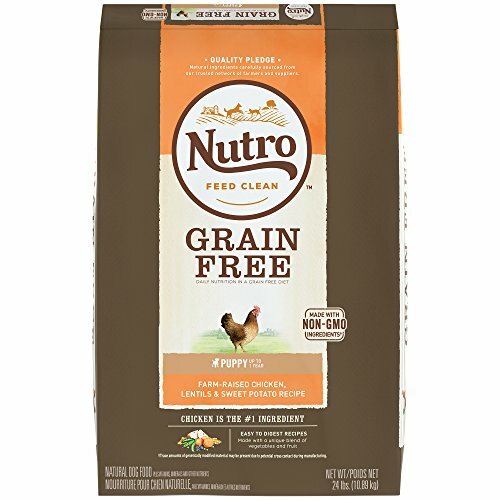 Why the Nutro dog food reviews and Nutro puppy food reviews? Can I mix any dog foods together for my puppy? Why are there so many puppy foods and dog foods with sweet potato? What’s the role of iron in my puppy’s food? 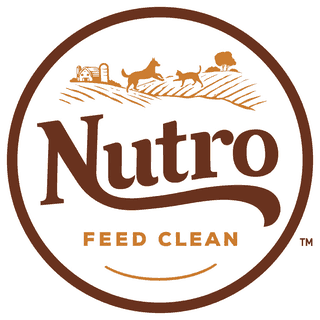 Nutro are over ninety years old and have their headquarters in Tennessee. The company is owned by Mars Inc., who acquired them in 2007. Like a lot of successful dog and puppy food brands, they also make cat food and have a strong focus on producing what they call ‘clean’ food- or kibble and chow that’s made without genetically modified ingredients. The company also take part in and run quite a few charitable initiatives, such as a program that upgrades dog parks, and local pet food donations throughout the States. What do you think, isn’t that great? 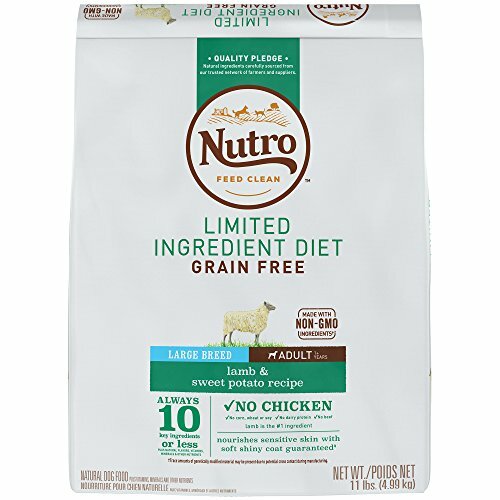 Nutro make a wide range of different formulas, which is why we’ve included Nutro large breed puppy food reviews AND Nutro small breed puppy food reviews amongst our regular features. So we can save you time shopping, we’ve summarised the three brands that Nutro make- Nutro,Max, and Ultra. Nutroalways uses either salmon, venison meal, lamb, or chicken as the key protein ingredient. You’ll find there are several lines depending on whether your puppy or dog requires a hypoallergenic (Limited Ingredient), gluten-free (Grain Free), weight loss (Lite and Weight Management), or even just a luxurious snack (Petite Eats). There’s also a Wholesome Essentials range under the Nutro brand, which includes special breed-specific meal options from toy to large, as well as life-stage-specific kibble for puppies, mature dogs, and veterans. There are a lot of chicken and lamb recipes in the Wholesome Essentials range, but you’ll also find venison and salmon. The Max line of dog foods offers both grain-free and regular options, but you’ll find absolutely zero corn, or wheat, or soy in any of them. When grains are used, they will typically be whole rice, oatmeal, or sorghum. The two former ones are really gentle on digestion, and the latter is usually gluten-free. There are actually fewer veggies and fruits in these recipes than you’ll find in the Ultra line, for example, but it’s still super healthy and draws on multiple protein sources like chickpeas and peas. Ultra offers a mix of proteins, but always with real, boneless chicken in the top spot. You’ll find superfoods dotted all through these formulas, like chia seeds, flaxseeds, kale, spinach, and blueberries for vitamins and antioxidants. There aren’t any recipes in the Ultraline that are totally grain-free, but we’re definitely digging the all-natural nutrient sources. Using genuine meat as the top, key ingredient in many- if not all- of their recipes. Summing it up, Nutro are definitely one of the healthier brands in terms of ingredients. They make high-quality food that complies with stringent safety and nutrition standards, and they have a reliable reputation as part of a larger, international company. Let’s take a look! Real chicken, as well as chicken meal, atop the ingredients list for this puppy food that’s entirely gluten-free. Please don’t get chicken meal confused with by-product chicken meal, as while the second is commonly used as a filler, the first is a rich source of dehydrated real-meat protein. Perfect for pups of up to 8 months! Contains potato, which some dogs may be less able to tolerate. This one’s a fitting choice for puppies of any weight between 10 lb and 200 lb! That’s especially great if you’ve got more than one pup and more than one breed! A non-GMO, grain-free lamb dinner for adult dogs who can’t handle gluten. It’s particularly soft on digestion because sweet potato is the main source of carbs, which is always a plus! Zero non-natural coloring agents or flavors. 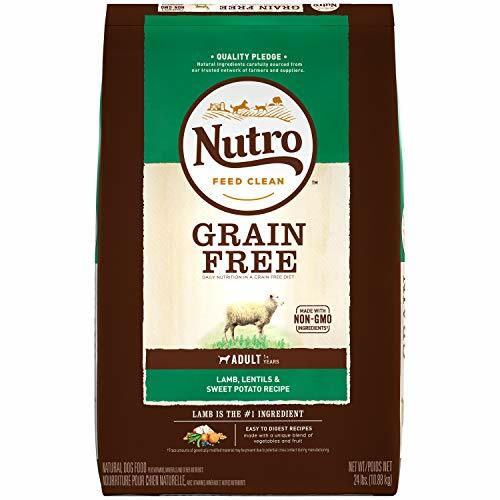 Like the grain free version of Nutro puppy food that we’ve just recommended, it also contains potato. This grain-free adult lamb and lentil formula is pretty excellent if you want to make sure your adult dog isn’t getting too much of any one ingredient. Because even dogs with zero intolerances can benefit from a wide variety of ingredients in their diet, this is a five-star option in our books! Here’s one for the larger puppy breed owners- and as such, the recipe’s tailor-made for a longer development period that can often last up to over 12 months. Perfect for Great Danes, St Bernards, and other giants. Absolutely zero milled by-product ingredients. Contains rice, in several forms, so it’s not for puppies who need to be going grain- or gluten-free. Larger puppies also require relatively high levels of glucosamine and it’s sidekick chondroitin in order to help stave off joint problems. Chicken meal’s an awesome source of these nutrients within this Wholesome Essentials puppy kibble. Tiny and even toy puppies are going to need small, small kibble pieces. That’s all taken care of in this Nutro Ultra dinner that’s a blend of several healthy proteins. Chicken is accompanied by both salmon and lamb for some variety and a super 29% protein! Amongst these are kale, spinach, pumpkin, apple, blueberries, carrot, and even coconut! 2% calcium, alongside DHA, zinc, and Vitamin E.
Made with some egg, so not ideal for small puppies who are allergic. 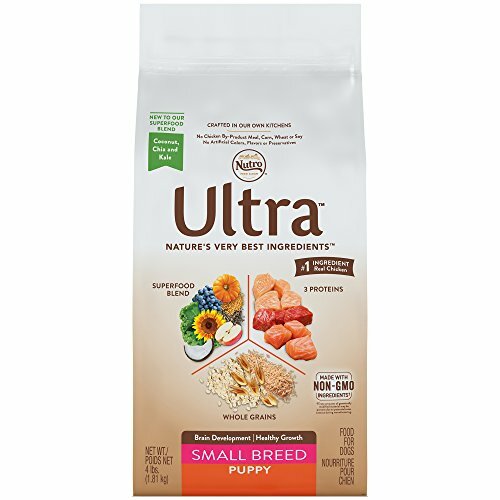 This puppy food’s specifically crafted for the shorter development phases of smaller breeds, such as Poodles, Chihuahuas, Daschunds, Yorkies, and Poms. We love that there’s even coconut in this recipe, yay! Another blended protein formula, so great for a range of amino acids. Whole grains such as rice and oatmeal help digestion. There’s avocado in here, too, and it’s dried avocado flesh- this is probably one of the very few safe ways for puppies to eat avocado, and it’s added for phytonutrients, fiber, and antioxidants, along with B vitamins! This formula’s got wheat gluten, egg, and potato starch. There are a few potential allergens in this food, but if you’ve got a puppy who’s not intolerant to anything specific, this offers a combined blend of proteins, a healthy total fat and protein content, and is soft on digestion. 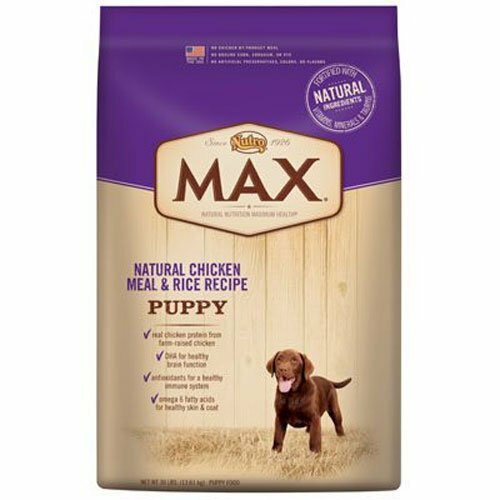 For puppies between the ages of 1 month and a year, we’ve included a Nutro Max dog food review because this brand’s SO popular with owners due to its use of only all-natural ingredients. 28% protein, which is from peas, oatmeal, chicken meal, and chickpeas! Fat’s derived from chickens- a nice, reliable, and identifiable source. While this formula has none of the most common gluten-containing allergens (wheat and so forth), it does contain rice, and for this reason isn’t suitable for dogs who need to avoid gluten entirely. 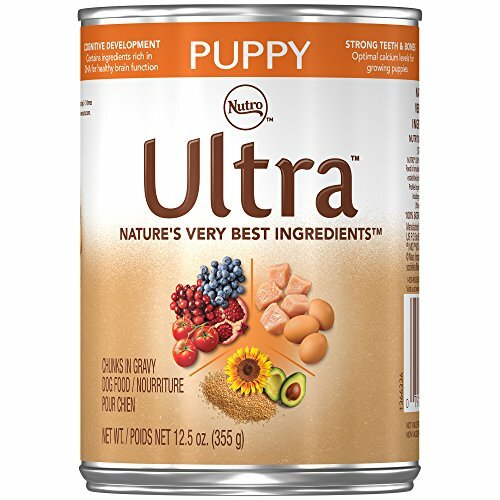 While this isn’t a grain-free formula, it gets full stars from us because we love when puppy foods are made without yucky by-products or synthetic preserving, flavoring and coloring chemicals. Rather, all-natural always gets a big ‘paws up’ from us! Limited Ingredient formulas are almost always crafted specifically to meet the dietary needs of those dogs who have allergies or intolerances. Here’s a yummy lamb recipe for large, mature dogs. There’s a pretty nifty feeding guide on this package, that makes it super-easy for you to adjust your dog’s meals according to his activity level. There are, however, potatoes in this recipe. here doesn’t appear to be a significant amount of glucosamine in this adult formula, because a lot of the time this is found in chicken meal and fish oil. On the other hand, it means that there’s only one kind of meat inside this recipe, which is what’s most important for dogs who require hypoallergenic food. Well, not ANY dog foods, actually. If you’ve got a puppy, then it’s typically much, much better practice to feed your little friend with chow or kibble that’s received the AAFCO tick of approval as a certified puppy food. For puppies, AAFCO-approved food must have a minimum of 22% protein, fat at 8%, and 1% calcium, amongst other nutrients, as these are what their experts deem necessary for healthy puppy growth. If you’ve got more than one dog, and are wondering whether it’s fine to mix in adult (or even senior!) 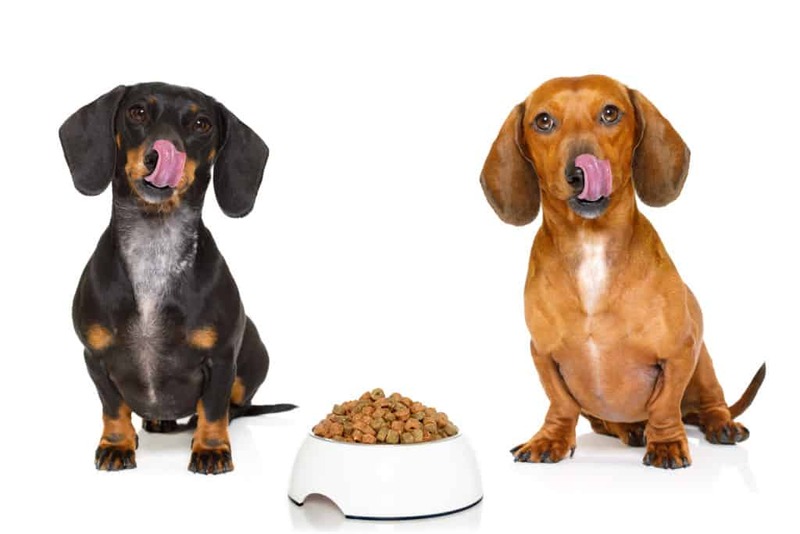 dog food into your puppy’s dinner, then you should be aware that the resulting recipe may not have enough of the different nutrients that your puppy needs to grow. Sweet potato is super-full of vitamins, soft on your puppy or dog’s digestive tract, and a mineral-rich source of energy, to name three benefits of the veggie! Sweet potato contains no gluten whatsoever and is replete with Vitamin A, which your puppy will use for so many things- nervous system function, a beautiful coat, strong muscles, and healthy eyes. Maybe you’ve noticed, a lot of the recipes in our Nutro dog food reviews that are made without grains will contain sweet potato instead- that’s because they offer a different way for your dog to get some carbs while being safe for dogs who can’t tolerate gluten. Puppies and dogs need iron to prevent anemia, just like humans. 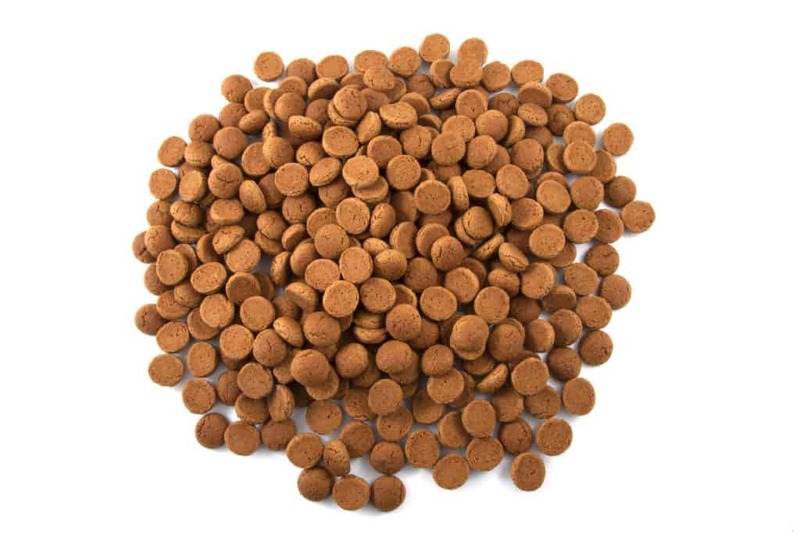 In some puppy foods, like the one in our Nutro grain free dog food review above, this may be added in as a supplement (iron amino acid chelate) and also through more natural sources such as lentils, peas, and garbanzo beans. Iron works by helping your puppy’s blood cells to carry oxygen, and it works in harmony with both copper and protein for a happy and active puppy!